I’m baaack. My life has been in transition for the last several months, but I’m now at a point where I have some free time on my hands. Yes, I’ve been laid off. So, being laid off with no immediate income, it seemed a perfect time to fantasize about spending a large load of cash on a dream project studio. Why not, eh? This post has gone through several revisions, so let’s see what we’ve got. My first vision for this article was the presentation of a dream home studio, pure and simple. Then I put together three different studios at three very different price points. What I think I’m going to do now, however, is take each piece of the studio and present a logical upgrade path with some descriptions why. The studios will consist of several major sections, each with individual components. I need to get audio signals into the recording, keyboard information into the recording, something to actually record the music, and manipulate the recording, and somehow to accurately hear what I’m doing. The first step in recording an audio signal is the microphone. There are a large variety of microphone types available – dynamic, condenser, ribbon, small diaphragm, large diaphragm. I may do a comprehensive post on home studio microphones in the future, but here’s a link to a decent one that I found: Microphones in the Home Studio. For now it’s simplest enough to say that different mic types excel at recording different types of sounds. At a minimum I want to use a Large Diaphragm Condenser (LDC) for vocals (esp. male), bowed strings and winds; and a ribbon as an alternative for vocals (esp. female), hand percussion and brass. Ribbons are also good for mic’ing electric guitar amps. A t the budget level I’m going for the Berhinger B-2 Pro for the LDC, and an Apex 215 for the ribbon. I’ve used both these mics and they are both incredible values for the money. You can hear vocals recorded on the B-2 here, and on this track the Recorders were all mic’ed up with the Apex. Each will set you back significantly less than $200, making this a great place to start. Moving up to what I’m calling the “Well Equipped” studio, we have a ton more options for mics. I have to admit to having much less personal experience with these mics, and am going off of reputation, reviews and testimonies. For the LDC I’m taking a good, hard look at the Blue Microphones Bluebird. Blue has a fantastic reputation in the industry and some of the coolest looking mic’s on the market. At $300 it’s still a great value, and likely the next mic I will buy. Also in this price range with good reputations are the SE2200a, the Audio Technica AT4040, and the Shure SM27. For the next step up in up in Ribbon Mics, there is no place to look but Cascade. I would step right into their Gomez short-ribbon mic. Their Fat Head mics have blown the industry away, but the similarly styled Gomez comes stock with high quality Lundahl transformers. At $500, it’s a bit steeper than the LDC, but thos mic is worth it. A new entry into the Mic category at this level will be the Small Diaphragm Condenser (SDC). These mics are especially suited for choirs, drum overheads and plucked strings such as acoustic guitar and dulcimer. 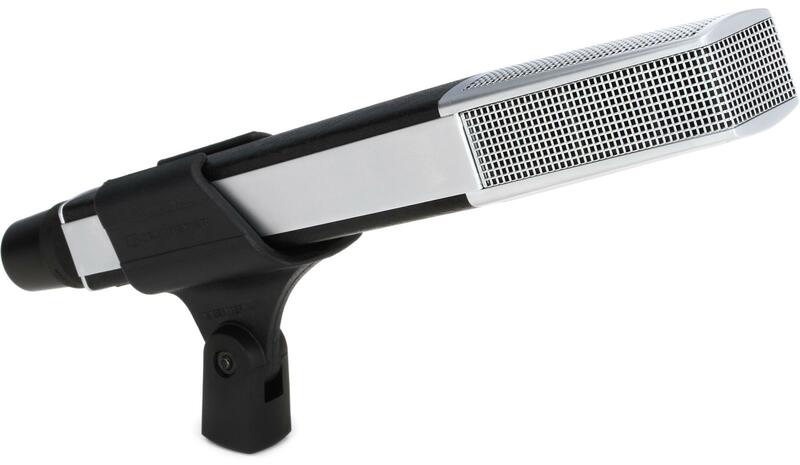 The industry standard in this category is the Shure KSM137. Granted there are a ton of options any more, and we’ll look at a few of them at the next level up. I mentioned drum overheads a few lines ago. Now is as good a time as any to address why I’m not going whole hog on a drum mic’ing setup. The main reason for that is because when recording drums, the room you are recording in is almost as important as the drums, mics and player all put together. It’s possible to get decent results close mic’ing everything as much as possible, but at this point in my journey, I think I would rather use some of the fine MIDI drums available. I just recently picked up Native Instruments Battery (thanks, Will). Add some drum pads and you have a reasonable substitute until such time as one can afford to record real drums. At the “Dream Level” the options are multitude. I’m going to arbitrarily set the dream level at $1k or so to keep things from getting too out of hand (it’s easy to spend upwards of $5000 on a high-end studio mic). For an LDC I’m lusting after a Mohave Audio MA-200. Don’t ask me why, I’ve never used it. It’s just a gut-level thing. Other options would include studio standard AKG C414, the boutique Bock Audio 195, or the baby brother Neumann, the TLM 103. It should be noted that the only option listed here with multiple polar patterns is the AKG C141. For the ribbon mic, the only place for me to turn at this level is the company that started the modern ribbon revolution, Royer. They have recently introduced their least expensive mic ever, the R101. This is a high level, made in America ribbon mic. While all ribbons (almost all) only come in figure-8 pattern, with nearly identical responses front and back, Royer claim that their R101 give a different response front and back, providing greater options when recording. Other ribbons mics in this price range include the Blue Microphones Woodpecker, the Audio Technica AT4080, and the SE Electronics VR2 Voodoo. For the Small Diaphragm Condenser we’re going to step up to a much nicer mic. Again there are a number of options at this price point, but limited slightly by usually using them in pairs, which ups the price a bit. For a single mic within our $1000+- price range, we could choose from the Neumann KM184, or the Sennheiser MKH 40, but I’m leaning toward the Earthworks SR-40. Earthworks is known for their super-clean measurement microphones, and this cardioid version carries the legacy on. At this level, we also introduce a new type of microphone, the Large Diaphragm Dynamic. Small Diaphragm Dynamics are what you see on practically every stage in America, held in the grip of the lead singer. While not as responsive as a LDC, SDD’s are much more rugged, and therefore appropriate for the stage. Large Diaphragm Dynamics, on the other hand, are definitely studio mics. Often thought of as voice-over or broadcast mics, they also excel at any low frequency task, such as bass cabinets, bass drums, and upright basses. Some options in this category include the Sennheiser MD 441 U, the Neumann BCM 705, and the Electro Voice RE27N. I don’t honestly have opinion about these models, but you can probably spend less than the spec’ed $1k and still get a decent contender (options from Heil and Shure come to mind). One last thing to mention about microphones. The well-equipped will have more than just the three, and the dream will have more than just the four mentioned above. A well-equipped mic locker will have several mics of each type. This is for several reasons – first, you may want to record more than one source at a time, such as a guitar and vocal, or two vocals at once. Second, and possibly more important, even though a given mic type may be generally better for a particular sound source, there are differences between mics within a similar type that will change the way they record the same source. For instance, mic A may be more flattering to a particular singer’s voice than mic B, even though both are Large Diaphragm Condensers. The long and short is that more mics means more options. This is both a blessing and a curse. More options means a better chance at getting the best possible recording of a source, but too many options can lead to “paralysis by analysis.” It you can’t make a decision about what mic to use, the moment can be lost. The best bet is to buy new mics sparingly, and get to know them well before adding another. The more familiar you are with your mic selection, the more quickly and accurately you can zero in on the best choice. Working quickly helps preserve inspiration, which is the most important piece of the recording puzzle.